Tunes and Spoons: quite appropriate for Halloween don't you think? quite appropriate for Halloween don't you think? Yes, that is indeed a real bullet in Mr. Murphy's hand. 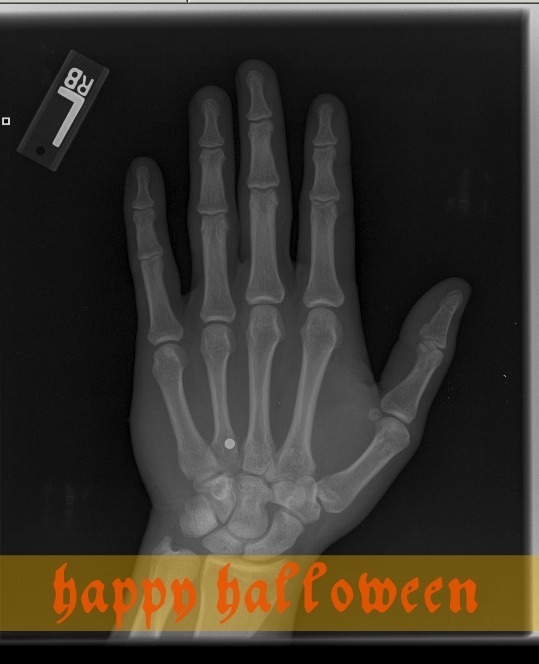 I think I am going to make it a family tradition to always use this x-ray as part of our family Halloween decor. It makes for quite the story. All is well now, but this past weekend was insane...insane I tell you. What the whaa?? I hope it was just a b.b. gun accident or something.. that's crazy! I read the bottom stuff before the top and I was like- is that a BULLET!? CRAZY! I'm glad everyone is OKAY! yikes!! hope he and his hand are okay! but i totally dig your idea of displaying it every halloween as part of the creepy decor :) And do share the story! Are you kidding me??? Ouch!! What happened?? oops- that last comment was mine. I forget to sign in a lot!